A year before she became the ‘It’ girl, Clara Bow starred as budding flapper Kittens in this Paramount silent. Kittens is a girl who loves to have fun. She and her father Hugh (Norman Trevor) both love to hit the town, leaving mom Ethel (Alice Joyce) at home all by her lonesome. A wrench is thrown in everybody’s fun when Ethel decides that she wants to live a little. She starts hitting the clubs and a man named Jerry (Conway Tearle) catches her eye — but Kittens has already been crushing on Jerry for quite some time as well. The film is based on a play, but doesn’t come off that way. All too often, early films based on plays read as very stagey. While this works on rare occasions, it is often a peeve of mine. Dancing Mothers, however, is quite well adapted. In addition to being well-adapted from the stage to the screen, the film’s plot is also quite captivating. It has a little bit of everything – comedy, romance, drama. While the “love triangle” plot is extremely common and often seen as overdone, it’s carried off well here as a mother and daughter are competing for the same man, rather than just two random women. 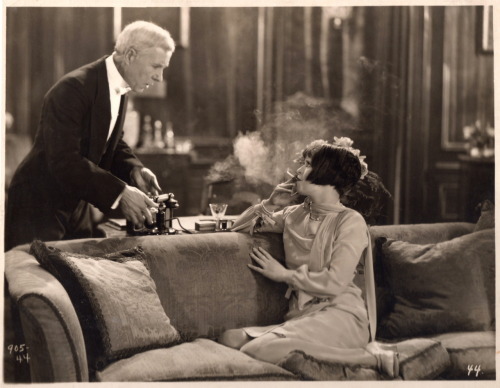 As usual, Clara Bow shines and is the most captivating performer in the film. She makes Kittens a delight to watch, when the character could have easily traveled into “obnoxious party girl” territory. Alice Joyce comes close to matching her, but doesn’t quite succeed. Their performances together carry the film, but Clara is just too hard to ignore to be overtaken by Joyce. Previous Previous post: This week’s library picks!